Folksinger Eric Andersen was a big part of the 60s Greenwich Village folk music scene. But he never had the commercial success that others had. The 1972 album Blue River was an attempt at a commercial success. And though it didn't work out, Andersen is still touring and recording today. He was born Feb. 14, 1943 in Pittsburgh but he grew up on the Buffalo suburb of Snyder, NY. After traveling to Boston and San Francisco, Tom Paxton brought Andersen to New York where he settled in to Greenwich Village. Andersen recorded several albums for the folk label Vanguard. Some of his songs were recorded by others, most notably Thirsty Boots by Judy Collins. But Andersen knew he would have to leave Vanguard to achieve commercial success. He recorded the 1968 album Avalanche for Warner Bros. at a time when Warners had just been sold to Seven Arts. so Andersen's album fell through the cracks. It was produced by Jerry Goldstein who went on to great success with War. After two albums at Warner Bros.-Seven Arts, Andersen moved to Columbia for the 1972 album Blue River. He was sent to Nashville to work with veteran producer Norbert Putnam with Nashville session musicians backing him up. The album was great and it sold OK. But it wasn't the breakthrough that either Andersen or Columbia president Clive Davis wanted. 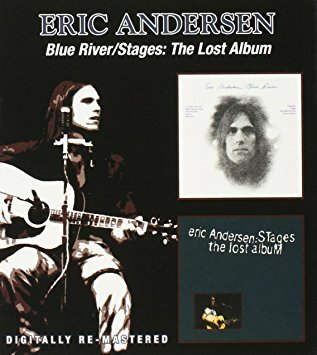 Andersen recorded a second album Stages again with Putnam and guest musicians like Leon Russell, Rick Danko and Garth Hudson. But somehow the master tapes were misplaced at Columbia and so Stages wasn't released until 1990. You can get Blue River and Stages on this twofer from the reissue label BGO. Andersen went to Arista with Davis in 1975. After three albums at Arista, Andersen moved to Europe. He toured in the 80s but he didn't record much. He resurfaced with the group Danko Fjeld Andersen with Rick Danko and Jonas Fjeld. They toured and recorded through the 90s. In recent years, Andersen has recorded for Appleseed most recently on the German label Meyer Records. Andersen lives in The Netherlands and he is supposed to have a new album coming out called Dance of Love and Death and a documentary called The Songpoet is in production and scheduled for a 2018 release. Here's Eric Andersen performing Faithful at the 1986 Philadelphia Folk Festival.